Specific goals are well defined and clear to anyone who has basic knowledge of the project. Measurable goals mean you know if it’s obtainable and you can mark progress until completion. "Agreed upon" refers to goals that require other participants; sometimes you need to rely on someone else in order to make a something happen — just make sure they have agreed with their part. Realistic means keeping the goal in tune with available resources, knowledge, and a time frame. Time-based means giving yourself enough time to achieve the goal, but not too much time so you lose sight of completing it. Crafting SMART goals means you will have all of the pieces in place to succeed. So whether you are working on being more healthy, losing weight, spending more time with your family, or writing the great American novel, having a goal is a great idea. For more detailed information about setting goals, check out the article, Personal Goal Setting, from the Mind Tools website. What goals are you setting this year? Do you have a tried and true approach to achieving your goals? We’d love to hear about it, so please share with our apartment community in the comments. 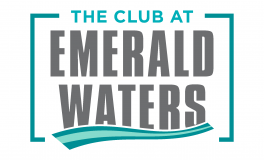 Thanks for reading The Club at Emerald Waters Blog today!